What part of a safety program does not include PPE, has nothing to do with guards and yet everything to do with you and your body? Ergonomics. You may think that as long as you keep your feet flat on the floor, knees, hips and elbows at 90 degrees, all while maintaining a flat back when seated, you’re in tip top shape for the workday ahead, right? If only it was that simple. “The scientific discipline concerned with the understanding of the interactions among human and other elements of a system, and the profession that applies theory, principles, data and methods to design in order to optimize human well-being and overall system performance.” – International Ergonomics Association Executive Council, August 2000. In general, it is the study of people in their work environment. Why might this be important? Ergonomics is something we encounter every day, whether we are at work, home, sitting in our car, or in front of the television. Remember how tight your lower back was after you sat in front of your computer for 4+ hours last week, that my friends is ergonomics. Before we continue, think to yourself, it would be nice if we were robots who could stand to be in a static posture for 4+ hours a day. Let alone 1 hour! I don’t know about you, but I get quite fidgety after sitting for extended periods of time. Even while writing this blog, I am constantly readjusting my posture. What I am trying to get at here, is movement is a part of life, we are organisms that are created to move. We are not robots and movement is a part of our DNA. Humans associate health with movement (i.e. exercise). So, would sitting in a static posture, like a robot, for extended periods of time be something that would promote a better, healthier work environment? I am not saying you should be doing push-ups at your desk, but what I am saying is your posture throughout your daily movement is the most integral piece to the puzzle. It is not moving as a whole, but HOW you move. For example, you are not going to pick up a box off the floor with your legs straight and your back bent. (If you think this is correct, please immediately STOP and contact The EI Group, for an ergonomic evaluation). The proper way would be to put your feet about shoulder width apart, brace your core, use a form of the squatting technique, then bring the object close to your core, then stand up out of your squat position. This would not only minimize the opportunity for injury during this specific movement, but it would also ensure force is being generated by the correct muscles within the body to allow the body to perform this task with as little effort as possible. In conclusion, ergonomics does not start at your desk and stop at picking up a box off the floor. It can extend beyond this to turning a wrench, holding a drill, tool design, balance and even warm-ups before performing a manual task. 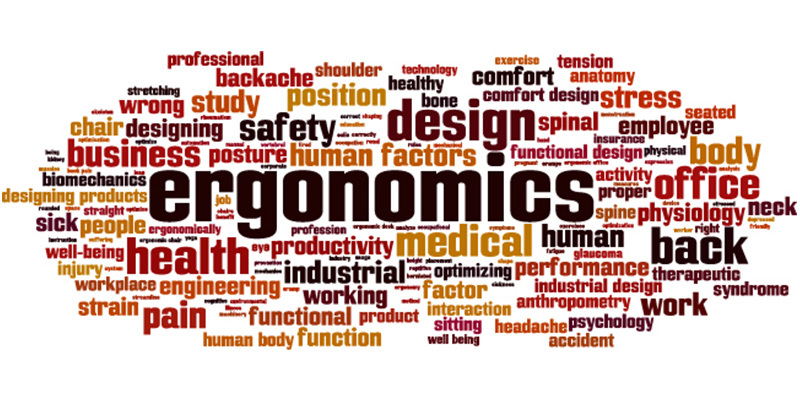 If you have been in doubt about the benefits an ergonomic program in your work environment may have, I hope this has shed some light on the importance ergonomics can have on your safety as well as your overall health. If you have any questions regarding ergonomics or other safety-related program, please contact me directly at 919-459-5243 or jstewart@ei1.com.